It doesn’t get cooler than this! A mug with Negan’s face and a mini-version of Lucille for a handle! If you’re not ashamed to admit that you’re a Negan fan, than you should be drinking your favorite beverage out of this! Rest your head on this awesome pillow featuring cartoon head-shots of your favorite Walking Dead characters. Not only are the likes of Rick, Michonne and Daryl there, but gone characters too like Glenn and Hershel! Some fans are so wrapped up in a show, they start to believe they’re apart of it. If you know someone who’s starting to act like those grisly walkers, treat them to this hilarious t-shirt. Help your obsessed friend get accustomed to the walker life by providing them with this walker to do list. Nothing to do? Find yourself bored easily? Compete for a game of Walking Dead trivia with over 400 questions about your favorite television show! You’ll start the game as a human but with every wrong answer, you become a walker! Staying positive and out of harm’s way is necessary in a doomed world. With this Zombie set of shelf sitters, you’ll be reminded daily to hear no evil, see no evil and speak no evil. This figurine ornament mimics the iconic three wise monkeys and will look perfect on any zombie-fan’s shelf. Those Walking Dead fans are well-accustomed to blood-spill and gruesome images. If your friend doesn’t squirm at the sight of blood and guts, this walker feasting glass set should be theirs! Only the boldest and bravest of fans should drink out of these! This t-shirt will help that obsessed fan blend in with those dreaded walkers! They’ll prevent being eaten thanks to the HD photo of several hideous zombies printed all over! If you agree that Daryl is the best character on The Walking Dead, get your hands on this highly articulated figure that will remind you to stay strong and badass every day. The detail is so fine, it will be as though you have your very own Daryl in your life. This bath robe is necessary if you want to survive the cold winter months. It’s soft, it’s snuggly and it’s ideal for fans of the hit television series. It’s even features zombie scratch marks as well as the show’s logo on the back! The Walking Dead can be quite depressing to watch at times. Light up those dark evenings with this awesome lamp which features a model of a walker reaching up towards the bulb. This Zombie Table Lamp is superb for that Dead Head in your life! Treat them with it now! The Governor and the Saviors have taught us that the living can be just as dangerous as the dead. “Fight the dead, Fear the living” – now that’s a motto to go by living in a world infested horrid humans! This Walking Dead mug will thrill any Dead fan! The blood splatter disappears as the mug fills up with hot liquid! Super-cool and “totally necessary” for survival on a cold winter’s day! In the real world, sometimes it’s humans you need to fear instead of walkers. No one will dare to confront you if you’re wearing this t-shirt. 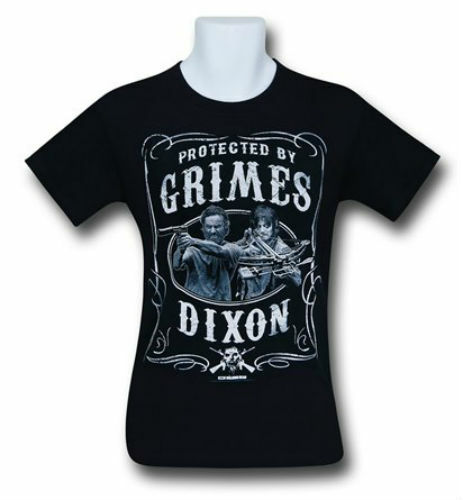 Rick Grimes and Daryl Dixon is all the protection you’ll need. If Negan inspires you to get through this world using violence (we hope not), grab this Lucille keychain. Seriously, how cute is this? If there’s nothing to keep you warm and comfy, then opt for these Walking Dead lounge pants! They will make a great gift for a Dead fan, or even for yourself. Who knew being a Walking Dead fan would be so fashionable? This charm bracelet makes the perfect gift for any fan of the show – especially those fighting to survive in a walker-infested world! Want to be the leader of your gang? Keep this Rick Grimes action figure close to you at all times to get some inspiration from the show’s lead character. The incredibly detailed figure would make the perfect gift for a loved one who’s a serious Walking Dead devotee. Know a Walking Dead fan who’s got an awesome sense of humor? Why not purchase this super-cool Smokin’ Dead Zombie ashtray just for laughs? It will put a smile on their guests’ faces, we promise! We’ve found the ultimate Walking Dead gift for Daryl fans. If you know someone who eats, sleeps and breathes Daryl Dixon, then perhaps it’s time you treated them with this replica of his bag – how cool! Admit it, you love to hate this villain! Negan’s sayings go down as some of the funniest in television history. If you have the guilty pleasure of liking the show’s deadliest villain, then purchase this great t-shirt! Only truly obsessed Daryl Dixon fans should own this item! Like we mentioned our list of Walking Dead facts, Daryl’s crossbow sells at Walmart! Guess what? It also sells on Amazon! This replica of his crossbow is ideal for role-playing and dress-up thanks to its fine detail. Made to look exactly like Daryl’s beloved weapon, this gift would please any Walking Dead fan. Ward off unwelcome guests with this fantastic, realistic Zombie Holding Lantern! This solar powered garden light lamp will help you keep your eye on any looming walkers humans. Carry Daryl’s crossbow everywhere you go with this super-cool keychain. Once you have your archery skills on point, there’s nothing stopping you from attaching this to your set of keys! Dare to own your very own version of Lucille? If you were in an apocalyptic world, you’d slam this onto a walker’s head in no time but of course, this replica of Negan’s dreadful weapon is simply for show and not to be used on people. Crafted to match the exact specifications as the bat carried by Jeffery Dean Morgan, this Lucille replica is for die-hard fans only. Does that fan in your life have an obsession with walkers? If they’re not afraid to look those zombies in the eye, treat them to this gift. This poster will help them familiarize themselves with a few dead faces. If you’re just as confident, cocky and conniving as Negan is, then you should be wearing this t-shirt! Maybe you know someone who secretly admires The Walking Dead antagonist! Splurge a little on this awesome item of clothing! 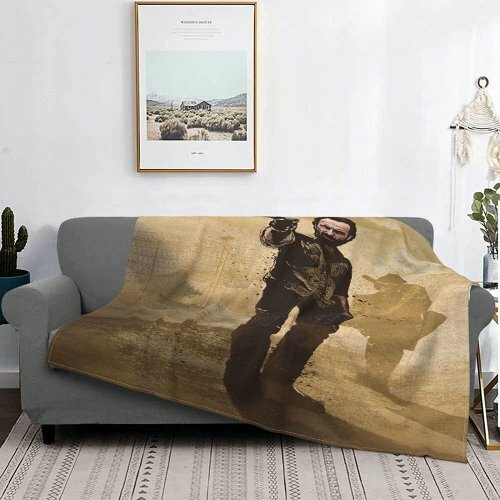 Our list of Walking Dead merchandise is superb if you’re looking to gift-wrap something for that Dead fan in your life. Keep their obsession thriving by treating them with an item here today! If you’re a huge fan of the show, check out our list of hidden Walking Dead Easter Eggs – if you haven’t found them already!